This is an early reader for children ages three and up who are on their way to reading independently but who may need help. The story is a retelling of a Maasai folktale about how a young warrior teaches his younger brother to have courage. Richly illustrated with original drawings, the book affords readers a glimpse into both the culture and the landscape of the Maasai people of East Africa, while simultaneously addressing some universal issues of childhood. This book was published while I was still a graduate student at Bank Street College of Education, where I took my Masters Degree, specializing in Early Adolescence. I was simultaneously an assistant in the Center for Children’s Literature. When I proposed the Maasai folktale of two brothers, they immediately decided to give me a chance with it. It was the first and only children’s early reader that I ever wrote, and it has been a bestseller ever since! ‘I am not Afraid!’ is a story of two brothers who travel together while tending their cattle. 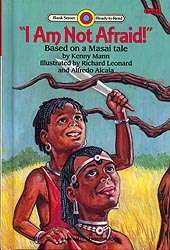 There is no reference to a geographical or cultural setting in this story but the author’s note indicates that it is based on a Masai tale. The youngest brother, Leyo, is frightened when the river roars at him for “stealing” its water and when the tree from which he chops firewood accuses him of “stealing” its branches. Such conversations between humans and inanimate objects of nature are an accurate reflection of a style that is common in many Masai tales. Tipilit (the elder brother) shows Leyo how to take from nature without being afraid. He explains to Leyo that if he takes only what he needs and no more, he does not have to fear the river or the trees. Tipilit’s character exemplifies courage and bravery which are two character traits highly valued amongst the Masai. Leyo learns much from his elder brother on how to be respectful rather than fearful of nature. At the end of the story Leyo is caught by what the author describes as a nine-headed “demon.” It would have been more accurate for the author to refer to this nine-headed being by its traditional name of “oga” or to refer to it as a “one-eyed monster” rather than label it a “demon.” When Leyo is caught by the one-eyed monster, Tipilit once again comes to the rescue by fighting off the monster and showing no fear. The book concludes with Leyo modeling the fearlessness of his brother. The strength of this book lies in its exploration of the importance of respecting nature. Young children will also be captivated by the suspense that is created in the face of fearful events.